Tropical storm Harvey has killed five people, and more than 1,000 have had to be rescued. Emergency crews are racing to keep up with calls for help. It's been called the worst storm to hit Texas in 50 years — and it's not over yet. Tropical storm Harvey, a Category 4 hurricane, has left five people dead and forced thousands to evacuate Houston and other parts of Texas. In the last two days, more than 63 centimetres of rain has fallen, turning roads into rivers and overwhelming city officials and residents alike. "This is a very, very dangerous storm with catastrophic consequences. Folks need to not underestimate that it is going to be a sustained challenge for the coming days," said U.S. Coast Guard Vice Admiral Karl Schultz. Other than flooding, Harvey also spawned tornadoes around the Houston area. One of them hit Tammy Elizondo's house in Richmond, Texas, about 45 kilometres southwest of Houston. She says when the tornado hit, there was lots of panic in her household. "We weren't expecting it ... It's kind of one of those things that you hear it, you take it seriously, but you don't exactly expect it to hit your house," Elizondo tells The Current's host Matt Galloway. At 2 a.m CT. when the tornado hit their house, she describes hearing loud "cracking and popping and like the roof was trying to be sucked in." Elizondo recalls yelling for the kids and her husband to run into the bathroom. "It happened so fast," she said. When it was over, they opened the doors to their backyard "to see six rows of fences just completely gone." "The neighbor's house, they lost about 80 per cent of their roof, which was on top of our roof, and their chimney stack had punctured our roof." Elizondo tells Galloway it's still raining now — "My street looks like a river." "We're hoping the rain will stop before it gets to the house. But we're ready to go if we need to, although I don't know how far we can get just because of how much water is surrounding everywhere." 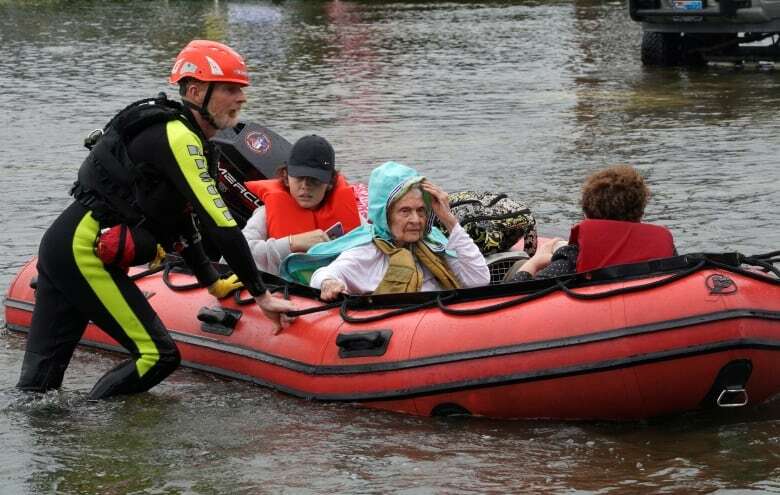 Many people remain trapped by water in and around Houston with a weather forecast calling for yet more torrential rain. As emergency services continue to be overwhelmed by calls, many neighbours have taken to trying to rescue those in need themselves. 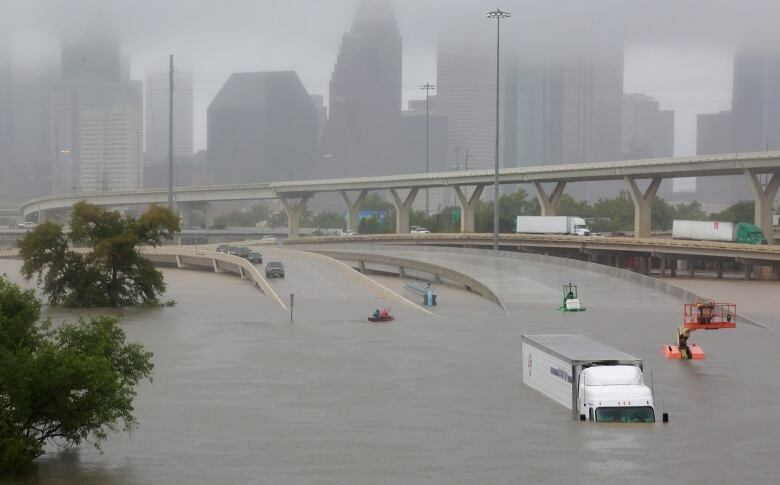 "There's a real sense of sort of desperation in Houston ... not knowing who to actually turn to at this point," says Rick Jervis, a reporter for USA Today in Houston. He says the Houston Police Department received 56,000 calls in 15 hours. Jervis tells Galloway that with several feet of water outside houses, many are stuck having to climb on roofs to wait for help — an impossible feat for the elderly and sick. "So people are kind of stuck in their homes. 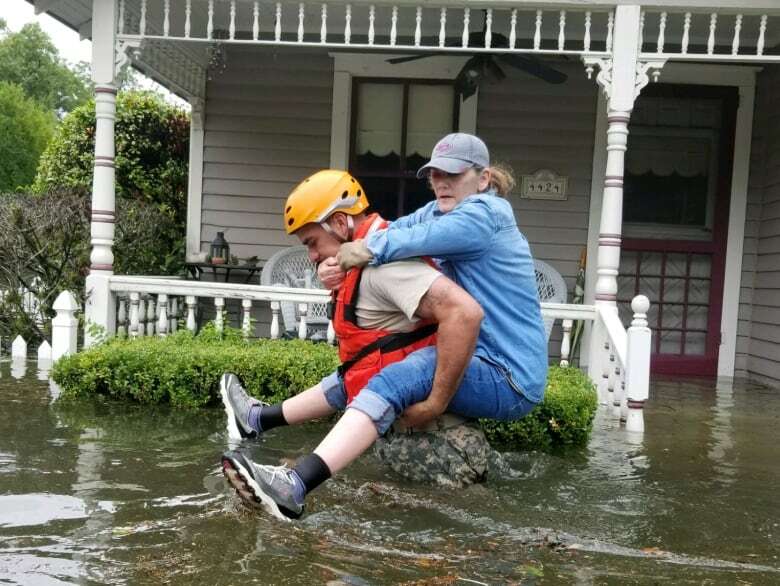 I heard from one person yesterday who was stuck with her grandmother in waist-high water inside their home ... calling everybody they knew, but was just kind of stuck, and didn't know what to do at that point." The rain isn't letting up anytime soon. "You have a storm that basically is just refusing to leave. It's stalled out over the Gulf Coast right over Houston, essentially just sending band after band of rain into the city," says climate scientist Brian Kahn. "Even though Harvey has started to move a little bit, it's actually going to hook back and go back over Houston for a couple of days." Jervis warns these kind of storms aren't going away and says it should be a wake up call to climate change deniers like the governor of Texas and U.S. President Trump. "They need to be thinking about them even if it goes against their belief system and what they feel comfortable acknowledging. This is reality." This segment was produced by The Current's Karin Marley and Idella Sturino.